My day job is faculty development at the Center for Teaching Excellence at VCU, but my doctorate is in Education Leadership, and with 22 years in the Navy, graduate hours in management beyond the Ed.D., and a half dozen business courses taught over the years, leadership remains a strong interest area of mine. So when Tom Peters in his blog suggested a new book by the co-founder of one of my favorite business magazines, FastCompany, it caught my attention. 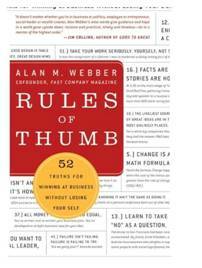 I have just finished Alan Webber’s Rules of Thumb. : 52 Truths For Winning at Business Without Losing Your Self (2009). It is a quick read and yet deserves reflection and discussion. Webber previously took the traditional business magazine in exciting and rule-breaking directions with FastCompany, and his reason for writing this book is that these amazing times require one to rethink, reimagine, and recalibrate what is possible. In other words, it is time to rewrite the rules. In short, Rules of Thumb, featuring 52 “rules,” is a marvel. Practical. Philosophical. Fun. And, above all, wise. Ever so wise. #10 A Good Question Beats a Good Answer. #14 You Don’t Know if You Don’t Go. #16 Facts Are Facts; Stories Are How We Learn. #20 Speed = Strategy. #23 Keep Two Lists: What Gets You Up in the Morning? What Keeps You Up at Night? #26 The Soft Stuff Is the Hard Stuff. #28 Good Design Is Table Stakes. Great Design Wins. #29 Words Matter. #33 Everything Is a Performance. #42 The Survival of the Fittest Is the Business Case for Diversity. #45 Failure Isn’t Failing. Failure Is Failing to Try. #46 Tough Leaders Wear Their Hearts on Their Sleeves. #49 If You Want to Grow as a Leader, You Have to Disarm Your Border Guards. #50 On the Way Up Pay Attention to Your Strengths; They’ll Be Your Weaknesses on the Way Down. #52 Stay Alert! There Are Teachers Everywhere. Fact is, I love Alan, and I love his book. Yes, he truly is a wise man. 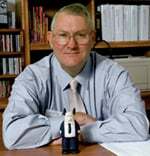 Ahhhh…as only Tom Peters can write! But I agree with him. In fact, what struck me was how many of the rules fit our current initiative to help faculty move their teaching and learning online. So I thought I would spend a few blog posts examining Webber’s rules and their fit with our initiative. Rule#1 – When the going gets tough, the tough relax. Webber noted that one of my heroes, Edwards Deming, was famous for his eighth point in creating quality in an organization – Drive Out Fear. Webber suggested that you not let fear undermine your chance to do what you want to do. I could suggest that this equally applies to faculty considering teaching online, but for me, it suggests a deeper truth – No course will ever have learning at its core if fear rules the students. Webber suggests that one should smile and enjoy the trip. I would say that works equally well for faculty and students in an online class. Rule #2 – Every company is running for office. To win, give the voters what they want. Webber noted that every day you are running for office, and that every vote counts! He states that you have to prove to your customers that you get them and care about them. While I would not necessarily equate students with customers, I do believe that it is important that online students “see” you as a real person that cares about them and their learning. Giving students what they want does not mean watering down a course, it means giving students clear organization, clear directions, and the respect to allow them to be co-explorers in the learning process. Rule #3 – Ask the last question first. Webber noted that when one starts with “Do you know the point of the exercise?”, it becomes a way to reverse-engineer the project. In a similar manner, students will understand their online work better if they understand what the point of any assignment is…how it relates to the learning objectives of the course and ultimately to why your particular course is important and relevant to their lives. Rule #4 – Don’t implement solutions. Prevent problems. I was always impressed that the first time a Sony Trinitron TV was plugged in and turned on was when a customer pulled it out of the box. Sony did not wait until a TV was built to test it, it incrementally tested each component along the manufacturing process such that the assembled TV worked, period. That makes sense in manufacturing, yet too many faculty use only a mid-term and final to assess the learning that takes place in their classes. Building in formative assessment and shifting the responsibility for learning equally to the students makes as much sense in online learning as it does for Sony. Rule #5 – Change is a math formula. The formula is that change happens when the cost of the status quo is greater than the risk of change. Up until now, most good online faculty have been early adopters. The status quo has worked for most faculty, who continue to teach the way they were taught. However, in the past few years, the internet has slowly become integrated into the status quo. From social networking to twittering, a new generation of both younger and older adults are routinely using the web as part of their lives. Failing to integrate the web into teaching and learning risks alienating this new generation. The tipping point is rapidly approaching where failing to provide online classes will be a marketing issue for some programs in higher education. Rule #6 – If you want to see with fresh eyes, reframe the picture. Webber quoted Ted Levitt who suggested that many companies suffer from a serious problem of not really understanding what business they were in. Some business do get it. Southwest Airlines is not in the transportation business – it is in the freedom business. Starbucks is not in the coffee business, it is in the “home away from home” business. Harley Davidson does not sell motorcycles, it sells a lifestyle. It begs the question – how do your students see your online course? Do you see your job as “teaching” or do you see yourself as someone who sets up a learning environment and builds a learning community? Rule #7 – The system is the solution. One could go many directions with this in higher education. After all, our schools and our courses tend to be very siloed, acting as if each was independent of the other. In truth, our courses are systems within systems, and our students spend four-plus years trying to figure out the interrelationships between them. It carries over in our online classes. We load students and content into a course management system and expect learning to occur. Learning would be optimized if we took a more system-level approach. I am a big believer in TPACK, which looks at the appropriate technology and the appropriate pedagogy for the specific content students are exploring. In our online class, we use a variety of social media to enhance the course management system and connect our students with others in the discipline. In the interconnected system, the whole is greater than the sum of the parts. Rule #8 – New realities demand new categories. Webber stated that solving today’s problems means moving beyond yesterday’s outmoded categories. The online environment is creating new categories every day – ebooks, unparallelled access to information, wikipedias, virtual worlds, open-source, crowd-sourcing, new forms of academic publishing, to name a few. In a hyperlinked world, a seat-time approach to education using hard-bound books no longer fits. Rule #9 – Nothing happens until money changes hands. Okay, maybe one rule that would be a stretch applying to online teaching and learning. After all, this book was written primarly for entrepreneurs. And yet, there is something to be said for not only creating enthusiasm for learning in your class, but also having tangible results – the first paper or the first video or the first podcast created by your students and submitted for your (and peer) review. Rule #10 – A good question beats a good answer. This resonates with me as a researcher. Good research almost always raises good questions as part of the research. Given how knowledge continues to grow, it makes sense that we develop our students to be questioners rather than parrots who feed the “correct” answer back to us. As history has too often shown, the correct answer only works for so long before a more correct answer comes along. Rule #11 – We’ve moved from an either/or past to a both/and future. Webber suggests that entrepreneurs today have to reject the old either/or choices and instead look for both/and synergies. When Barack Obama suggested that there were no red states or blue states, just red, white and blue states, he was reframing a both/and future rather than an either/or past. Higher education likewise needs to move past face-to-face or online classes to a both/and approach that gives both options to our students. At a past institution where I worked, the majority of our “online” students also came to campus and took face-to-face classes. We and our students should value building a degree around a combination of face-to-face classes and online classes. Rule #12 – The difference between a crisis and an opportunity is when you learn about it. I am a different teacher today than I was three-years ago. The reason – my network who continually feeds information to me, whether through Twitter, Ning, or Google Reader. This rapid assimilation of knowledge allows me to keep my course current and relevant. It suggest to me that these new skills I have developed now need to be part of my classes so that my students develop similar skills. Knowledge-sharing is now a normal part of my life, and it is a job skill my students will need. Rule #13 – Learn to take no as a question. While my passion is online teaching and learning, the reality currently is that most faculty who seek me out do so to web enhance their face-to-face class, and have no interest in online teaching and learning. And yet, to me, web enhancing a class IS online teaching and learning. I am slowly learning to take the NO about online teaching and learning as an opportunity to open a new dialogue with my colleagues. I am a victim of my own rose-colored glasses, and I really need to better understand the reluctance others have, so that I can do a better job helping them when the time is right for them to move online. I’ll continue with the next 13 in the next post. My question to you – on target or off the board? What do you think? “change happens when the cost of the status quo is greater than the risk of change“.